The biggest repository of Armenian literature in the world is the National Library of Armenia, founded in 1921, but officially inaugurated on November 7, 1922. 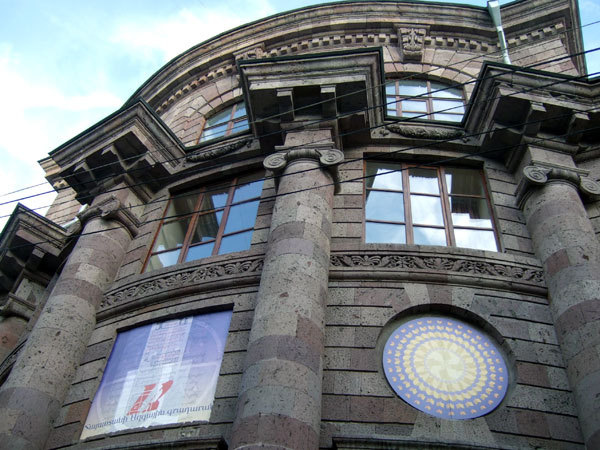 The beginning of its history is linked to the foundation of the library of the Boys Gymnasium of Yerevan, in 1832. (“Gymnasium” was the name of Russian schools that emphasized strong academic learning, similar to U.S. preparatory high schools.) During the first independence of Armenia, this library, with a collection of 18,000 volumes, became the main state library after a decree was passed by the Council of Ministers of the Republic. The first director of the library was Stepan Kanayan, between 1919 and 1921. His efforts were instrumental to collect and buy the libraries of various Armenian organizations and schools in Tiflis, Baku, Akhaltskha, and Kars, and transfer them to Yerevan. Various private and public collections were assembled and became the basis for what was known, during the Soviet period, as the Yerevan Public Library. Alexander Miasnikian, chairman of the Soviet of Popular Commissars (Council of Ministers) from 1921-1925, was instrumental in its foundation and initial growth. After his death in an airplane accident in 1925, the library was named after him and maintained that name until 1990 when it became the National Library of Armenia. Since 1999, July 4 is celebrated as day of the National Library of Armenia. The library has four buildings. The oldest is the main building designed by architect Alexander Tamanian (1868-1936), who designed the master plan of Yerevan, and finished in 1939. The number of daily visitors to the library is about 900. An annual average of 1.5 million pieces is delivered to library users. The library collection encompassed more than 6.3 million units as of January 1, 2014, including books, journals, newspapers, maps, posters, dissertations, musical notes, postcards, stamps, calendars, ex libris, banknotes, audiovisual and electronic supports (CDs, DVDs), etcetera. The library has the first printed book in Armenian, Urpatakirk (Venice, 1512); the first newspaper in Armenian, Azdarar (Madras, 1794); and the first map printed in Armenian, Համատարած աշխարհացոյց (Worldwide Map; Amsterdam, 1695). Its current director is Tigran Zargaryan.